If any justification was needed then the remarks of Paul Hartley speak volumes. "It's not a penalty. I've seen the footage and it's not a penalty." Over the course of a season good and bad decisions by officials probably even out but that hardly eases the irritation that follows when two points disappear with two minutes remaining. Is there consolation to be found when we admit that we would happily have accepted a point before kick-off? Cadden added to last week's impressive display with another fine performance. His goal needed excellent control and an accurate finish and he was clearly thrilled to get on the Motherwell score sheet for the first time. His ability to carry the ball deep into opposition territory with pace makes him a valuable asset. It would not be a surprise to see him on a long term contrast before too long. Our second goal showed Pearson at his best. A run through the centre of the Dundee defence was supported with a well placed return from Moult before our man ran in on the 'keeper. The finish was perfect. Both teams deserve credit for providing entertainment under brutal conditions as do the spectators. 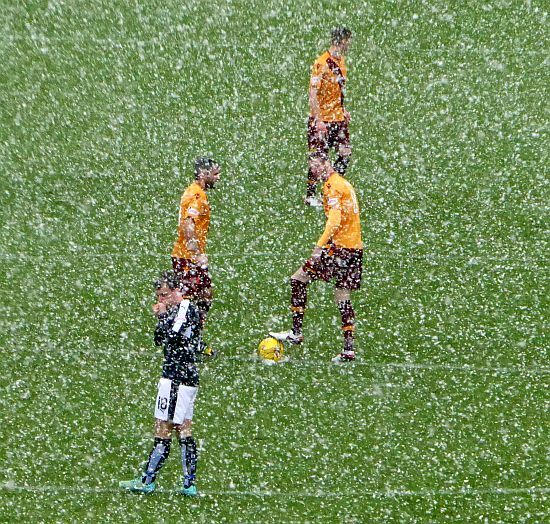 We can expect a similar battle on a heavy pitch if the game at Firhill gets the green light on Tuesday.